Growing up, on days my parents wanted an extra treat for dinner or perhaps simply too lazy busy to cook, we’d drop by a Siu Mei Store 燒味舖 (Roasted Meat Shop). Stepping into the shop, I’d be immediately mesmerized by the sweet & warm roasted barbecue fragrance. Looking through the glass cabinets of glistening, juicy, beautifully caramelized hanging pieces of meat, I just couldn’t stop myself from drooling! ? Oh yes~ Siu Mei is my weakness…from Siu yuk 燒肉 (Roasted Pork) to Char siu 叉燒 (BBQ Pork) to Siu ngo 燒鵝 (Roasted Goose) to Soy Sauce Chicken 豉油雞…I just want them all!! So, we’ve decided to create a simplified, faster, easier homemade “dump & go” version of Soy Sauce Chicken using just the legs! Super easy no fuss dump and go recipe – perfect for busy weeknights! First, add 3 tbsp light soy sauce, ½ tbsp dark soy sauce, 4 garlic cloves, 3 star anise, ½ tsp Sichuan pepper, and ¾ cup cold water into the pressure cooker. Then, partially submerge the chicken legs into the Master Stock Mixture. Add a tall steamer rack (as shown in left photo below) and place a stainless steel bowl filled with 230g Jasmine rice and 250ml water (as shown in right photo below). Fluff & set aside the cooked rice and rack. In a small mixing bowl, mix 1 tbsp dark soy sauce with 1 tbsp Master Stock Mixture. Apply the master soy sauce on the chicken legs to give it additional color and flavor. Pro Tip: don’t throw away this simple Master Stock Mixture! You can store it in the fridge or freeze it and reuse it for the next Soy Sauce Recipe. The more you use it to cook, the more depths of flavors it’ll develop. Serve the soy sauce chicken over rice with your favorite vegetables. Kid-friendly "dump & go" weeknight meal: Instant Pot Soy Sauce Chicken and Rice. 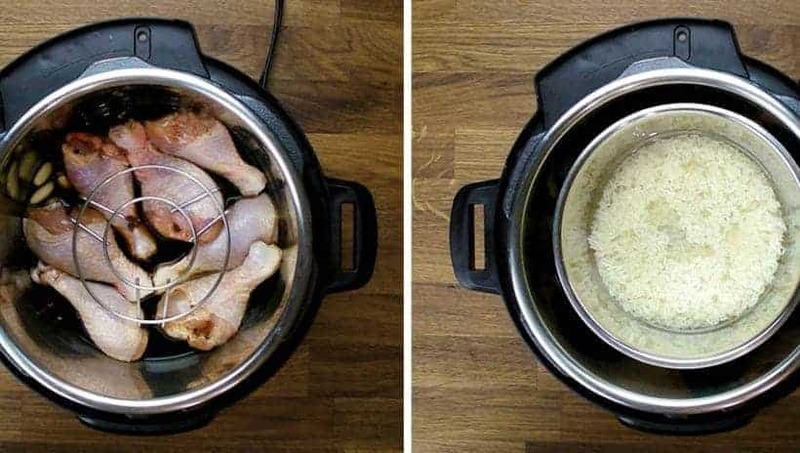 Convenient time-saving trick to cook Chicken & Rice separately in the same pot! Create Master Stock Mixture: Add 3 tbsp light soy sauce, ½ tbsp dark soy sauce, 4 garlic cloves, 3 star anise, ½ tsp Sichuan pepper, and ¾ cup cold water into the pressure cooker. Pressure Cook Chicken Legs: Partially submerge the chicken legs into the Master Stock Mixture. Add a tall steamer rack and place a stainless steel bowl filled with 230g Jasmine rice and 250ml water. Close lid and pressure cook at High Pressure for 8 minutes + 10 minutes Natural Release. Open the lid carefully. Fluff & set aside the cooked rice and rack. Apply Master Soy Sauce: In a small mixing bowl, mix 1 tbsp dark soy sauce with 1 tbsp Master Stock Mixture. Apply the master soy sauce on the chicken legs to give it additional color and flavor. Serve: Serve the soy sauce chicken over rice with your favorite vegetables. Master Stock Mixture: don't throw your Master Stock away, you can store it in the fridge or freeze it for your next Soy Sauce Recipe. The amount of sauce will remain the same. For boneless skinless chicken breast, I recommend 4 – 5 minutes pressure cooking time and 8 minutes natural release. Yes, you can use the pot in pot method for brown rice and quinoa. If you are using a stainless steel bowl, roughly 25 minutes for brown rice + natural release and 3 minutes for quinoa + natural release. For natural release on regular pressure cooker, turn off the heat and leave the pot on the stove for 10 minutes before venting. This recipe was written in our old format and will need to be converted to the newer format to have the nutritional information. We are working on converting all our recipes to the new format, but it will take some time to finish. Will it be ok to use light soy sauce only? Can I add salt if I have a “less sodium” soy sauce? I appreciate your blog! Thank you for the recipes! If you are not using dark soy sauce, you will want to add a bit of sugar to balance it out. You will want to add some salt for low sodium soy sauce as well. Please taste and adjust accordingly. Do I double the time if I double the quantity to 16 drumsticks? Thanks! Wow, after trying this recipe, it has become one of my favorite Instant pot meals ever. The Soy and star anise flavors I just can’t get enough of. Thanks for sharing. Hi Amy & Jacky, I followed your instructions (and even added more dark soy sauce in the end), but the color was not darker and the flavor was not quite as intense as the traditional soy sauce chickens that I’ve had in the past. Any idea what I could have done wrong? Any suggestions for future attempts? Please let me know because I love soy sauce chicken and rally appreciate how the both of you have taken the time to convert traditional Chinese recipes for the Instant Pot. Thank you in advance. thank you so much for your feedback and kind words on the recipe. This recipe is more meant for a quick meal so the flavor will not have the same depth as a full blown master stock. You may want to try this recipe for a true traditional soy sauce chicken experience. The master stock will get better as you continue to use it. The first chicken you cook in the master stock will be good, but the next one will resemble a restaurant quality chicken. Firstly I just want to say that I love love love your website- you peeps completely rock my kitchen, thanks so much. But I was wondering if I could use brown rice with drumsticks, or would I be best to do it after the chicken. For this recipe, it is best to do it after the chicken or the drumsticks will be overcooked. If I am using chicken leg quarters, how does that effect cook time? The cooking time will still be 8 minutes and 10 minutes natural release. Any suggestions for adjusting the recipe for frozen boneless chicken thigh? Boneless chicken thighs will take roughly 7 – 8 minutes and 10 minutes natural release. Make sure to partially submerge them in the cooking liquid. I have a question. How long can I leave my master stock in the fridge for before it goes bad? I forgot to put it in the freezer. It will last for 3 days in the fridge. Hello. If I want to use frozen chicken leg quarters. How should I adjust the cooking time? Finally got a taller rack and made this recipe. So simple but so wonderful. Can’t wait to build up my master stock. Thank you! Can I reuse the master stock for this recipe again? If I do, how should I use it? Do I add more stuff to it (garlic, star anise, soy sauce)? Or if I use it for another soy sauce recipe, how should I substitute it in? Also, I have to tell you that I love your website/recipes. I have tried several, and each one had been delicious. A huge thank you for everything! So happy to hear from you and thank you so much for your kind words. I would recommend this version of master stock as it will be a lot better in the long run for reusing. From time to time, the master stock will be diluted and you will have to add more soy sauce and maybe a little more spice to it. I just bought an instant pot and I would like to make this dish for the first time. But I wanted to add small potatoes instead of rice. Will this affect the amount of sauce or cooking time? Thank you so much. I have been browsing the Internet looking for instant pot recipes and I was excited to come across yours because I am of Chinese background. Can’t wait to try them! Your stories are inspiring as well. So happy to have you on our site! I would cut the small potatoes in half and layer them on top of the chicken drumsticks. Hi -I have my own rice cooker that I prefer to make for rice- therefore I was to cook without PIP rice- how long would I cook it for? I didn’t have any star anise but I googled and found out I can substitute with Chinese five spice. Only used 1/2tsp and worked quite well I thought. Just didn’t want to spend $10 for a bottle of star anise. So happy to hear from you again. Thank you once again for your kind words!! If there is an Asian market near by, star anise usually costs 1 – 3 dollars per bag. Loving your recipes, Amy + Jacky! If I want to cook 2-3 cups of rice do I need to adjust the cooking time? Thanks! For 2 cups of rice, the cooking time will be the same. For 3 cups of rice, you may need to increase the time to 10 minutes. I have a question about the pot within the pot. The one used to cook the rice in. Where can I get one like that? How would I adjust the cooking time if I wanted to use chicken breasts instead of drumsticks? We prefer white meat. Is this possible or will it not work for this recipe? Bone-in Chicken Breasts will take 5 minutes + Natural release. This is one of those recipes I’d love to try but cannot (Coeliac and lactose & soy intolerant). Can the recipe be doctored with tamari and/or coconut aminos with the addition of molasses to help sauce stick? I feel like I’m asking a dumb question but I’ve never cooked with dark soy sauce because of the gluten. This salty & sweet chicken combination sounds and looks yum. I love the depth, smoothness and saltiness of tamari (coeliac since birth but recently learned I’m soy intolerant and not happy about that!) so I’m determined to find a similar flavour profile for salty-sweet dishes by substituting coconut aminos. I’ll let you know how this food allergy challenged foodie-holic gets on with her experiments to ‘TRY’ to replicate this recipe post Christmas. I’m sure it’ll help me with other tamari substitution recipes in future because soy is a flavour-star in this dish. Just noticed I didn’t reply to your previous comment. If I want to use brown rice. What cooking time should I use? Brown rice will take roughly 18 – 20 minutes and natural release with the pot in pot method to cook. However, the chicken will be very tender and drier at that point. Hi! Loving your recipes! I’m an instant pot newbie with a LOVE for Cantonese HK style cooking. I’d like to try this one, but with a small (5-6) whole turkey or turkey breast for a Thanksgiving twist? How would suggest I modify it? Turkey breast can become quite dry in the Instant Pot. I would suggest cooking the breast for 18 – 20 minutes + 10 minutes Natural release. Thanks for another wonderful and easy recipe! ? I love your recipes! You have made cooking so much easier for me :). I plan to use chicken thighs with skin and bone for the recipe. How many do you recommend for your recipe and how should I adjust the cooking time? Thanks!! The cooking time will be 6 minutes + Natural release. As long as they are partially submerged in the liquid, you can cook as many as you can fit. Probably 8 – 10? If I were wanting to make more chicken afterwards, can I reuse the master sauce. Can the master sauce be recycled? if i want to double the recipe, would I need to double the water in the master stock mixture? Also, are there be any modifications to be made if I don’t want to cook the rice, but only the chicken? You can reuse the master stock. Make sure to adjust the seasoning if necessary. You will not need to double the water in the master stock mixture if you are doubling the recipe. Tasted pretty good, but I found that it didn’t really caramelise, the chicken came out very grey, and brushing it afterwards with the soy sauce/master stock mix didn’t really help, as it wouldn’t adhere to the chicken. Should I just use a bit more dark soy next time? Or possibly add a bit of sugar? Also, I put the jar of stock in the fridge and it’s now fairly solid; lot of gelatin, which is probably good for stock, but if I want to cook this again, would I need to heat it to melt it a bit, and does it need more liquid? If the stock mixture is not adhere to the chicken, you will need more dark soy sauce. Once the stock heat up, it will go back into the liquid state. You don’t need more liquid if you have about 1 cup of stock in the jar. So sorry to keep bugging you on your wonderful recipes! 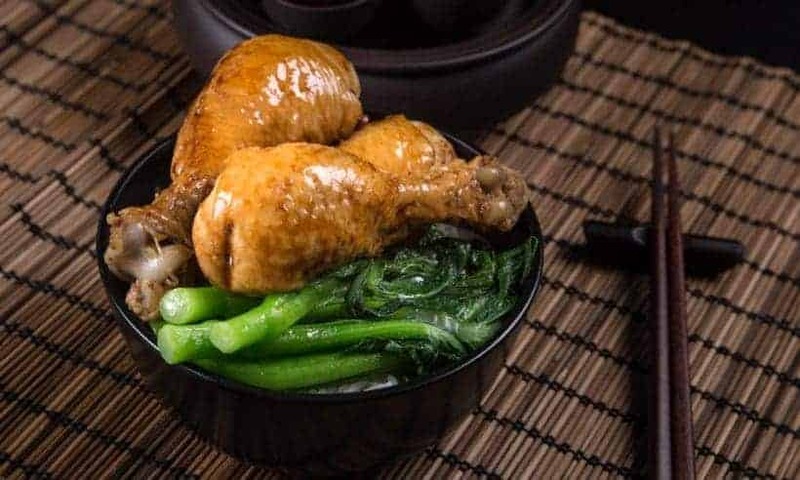 For this particular one (Soy Chicken), can we substitute the chicken legs with chicken thighs instead? If so, how many chicken thighs should we use for our 8 quart pot? I plan to double up or at least 1.5x the rest of the ingredients! You can use roughly 8 – 12 chicken thighs. Do Notes: since chicken thighs is not as thick, so it will be slightly overcook. I’ve never tried PIP, but this looks like an easy intro. I would like to make brown rice with my chicken, but I know it takes longer to cook. Any suggestions? Would maybe adding boiling water to the rice make it cook faster, without overcooking the chicken? Adding boiling water will not make too big of a difference. Only way I can think of is to cook the rice at the bottom of the pot and use the PIP method to cook the chicken above. One more question. Can I use this sauce to make soy sauce eggs on the instant pot? Do you have a recipe? Great recipe! I just made it tonight and the kids gobbled it up! I am wanting to make it again tomorrow with the mixture sauce. Do I just put the drumsticks with about 1 cup of the sauce? Or do I need to readd some star anise, peppercorns, garlic, soy sauce? Yes, you can use 1 cup of the sauce. Make sure to taste and adjust the seasoning. You can use the sauce to make soy sauce eggs, but I would recommend the proper master stock recipe as it will have more flavor. Here is the recipe for Soy sauce eggs! I have been making a more traditional stove top “Soy Chicken” for over 30 years. It’s a must in this family 🙂 My MIL was Cantonese and this dish is my husbands favorite way to have chicken. Almost same ingredients. I do add Pale Dry Sherry and some sugar. It was the first dish my boys wanted to learn to cook when they moved out. They sent me pictures on their phone with the bird in the pot when done all excited. I did a version in the IP about a week ago. I liked it but husband thought it needed to be stronger. I do cook the bird whole. You can make it stronger by fully submerging the piping hot whole bird into a mixing bowl filled with cold Chinese Master Stock for another 30 minutes. Tried it tonight and it was delicious. Not dark like when you buy it, but still tasted yummy. I used a whole chicken cut up and did my rice in the rice cooker. I wasn’t able to get to the pot after 10 mins of natural release, so it sat there until I came home. The chicken and bones were extremely tender. Definitely on the rotation now, because it was super fast to prepare. It’s great to hear from you again Karen :). Hope you have been doing well for the past few months. Hi … I tried it as my first IP recipe. My chicken was flavorful but it was a little light in color. Was it because I didn’t pat the chicken completely dry before putting it in. Also the steaming rack that came with the IP was too tall so I couldn’t make the rice inside the pot. For clarification … is it one rice measuring cup to 8 ounces of water? The stainless steel bowl can be layer directly on top of the chicken legs if the steaming rack is too tall. One rice measuring cup is roughly 160g of rice. It should be one standard cup of rice (230g) to 8 ounces of water. How would I adjust the recipe if I were to double it to 16 drumsticks instead of 8? Would I need to double the marinade and change the pressure cooking time? I plan to make this without the rice. You can 1.5x the marinade (As long as the drumsticks are partially submerged in the liquid then it will be okay). The pressure cooking time will remain unchanged. This recipe is BRILLIANT. First time ever cooking pot-in-pot, I am blown away by the convenience! Seriously, I had a terribly stressful day at work yesterday, I was tired and cranky and teary-eyed when I got home (dictionary definition of “hangry”!) and half an hour later I was eating this delicious dish and suddenly the world was brighter. May I ask one question? The rice was perfectly cooked, but I found it a little sticky. Could this be because I rinsed the rice before adding it to the bowl? Should I just throw it in next time without rinsing it? Also, if I may humbly offer a tiny modification – I seasoned my rice with a few drops of toasted sesame oil and some chopped spring onion (green part – I added the white part to the stock). SO! GOOD! Hang in there. Don’t let work stresses you out too much. Rinsing should actually make the rice less sticky. I think the rice were cooked in too much water. Toasted sesame oil and green onions are so good!!! Thanks again guys, and have alovely weekend! I tried this tonight…it didn’t taste like soy sauce chicken…in fact it didn’t taste like anything at all. Very very bland and the chicken had no colour. Applying the master stock and soy sauce at the end did not save it. Make sure to use light soy sauce & not low sodium soy sauce or dark soy sauce for the cooking liquid. If light soy sauce was used, please let me know which brand you used. Thank you! Dark soy sauce should be mixed with the simple master stock at the end to add color and sweetness. It wasn’t low sodium. I used kimlan brand for both light and dark soy sauce. It shouldn’t be a problem with Kimlan soy sauce as I have used that brand in the past. I will purchase some Kim lan soy sauce to see what kind of result it will yield with the recipe. Which tall steaming rack stand did you get (2.6 or 2.8″)? And how tall is your inside pot for the rice? Our steamer racks are 2″ tall and they work for the PIP method. We also have a 2.6″ tall racks that will also work for the PIP method. First of all Thanks for sharing this receipt! I love siu mai so much that I am considering to make it on my own! I am just wondering where can i buy the “inner” pot you have used in this recipe. My instant pot only comes with the rack and the pot, so I’m not sure what kind of inner pot I should purchase. We do have a siu mai recipe if you are interested. We bought ours (7.5″ x 3″ stand) at Daiso and you can probably find them in local Asian supermarkets as the pot-in-pot method is quite popular in Asia. Hi, I tried it tonight and I think it definately needs to add sugar to it, like Rock Sugar. If rock sugar is added, it will also add a nice glaze to it as well. 🙂 I’m from Hong Kong as well. Thank you for all the recipes you wrote for the instant pot! Really appreciate all the time and effort dedicated to Chinese or HK recipes. Can we add honey to the sauce if I do not have dark soya sauce? Thank you. It is better to just omit the dark soy sauce. I tried this today and while the chicken was tasty, it was pale in color and not golden like yours. I used one layer of chicken drumsticks and partially submerged them as in your photo. I wasn’t sure how the other side would get flavored. I did brush on additional sauce but it did not adhere like yours. I used Lee Kum Kee soy sauce for both the light and dark soy sauces in the recipe since my bottle did not specify whether it was light or dark. Do I need to purchase dark soy sauce to make it caramelized as in your photo? As I said, it was tasty but I would love to make it look more appetizing. Thanks! The soy sauce you used is most likely light soy sauce as you said the flavor is tasty. Yes, you will need dark soy sauce to make it caramelized as in the photo as dark soy sauce adds color and sweetness to the sauce. 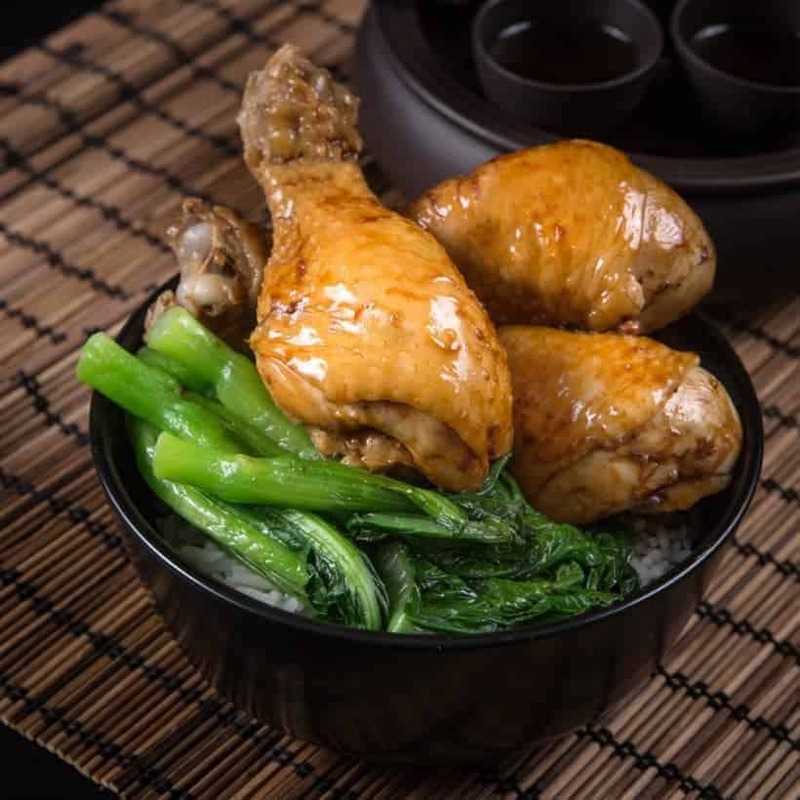 To get the sauce adhere onto the soy sauce, you will need dark soy sauce as it contains molasses which will thicken & help the sauce to cling onto the drumsticks. Where did you get your stainless steel bowl from? What’s the size? Looks delicious! No sugar in the sauce? I always thought soy sauce chicken has tons of sugar! Can I leave out the rice? And will it affect my cooking time? Thanks! Yes you can leave the rice out! The cooking time will be the same. Tried this last night and it’s great. Perfect for a time crunch dinner (quicker than take out). I have a question about re using the master sauce- if reusing obviously making sure the volume is 1 cup total, do you have suggestions for additional volume, or is this a “taste and decide” situation? As for the master sauce, it is mostly taste and decide. If your stock is going low in volume, add more water, Shaoxing wine, soy sauce and other spices to keep it from diluting. Thanks for the recipe! I made it with defrosted chicken thighs, and they were a little bit dry. I cooked using the same time – I realize that I should have decreased by a few minutes. Yes, bone-in chicken thighs will take 6 – 7 minutes as they are not as thick as drumsticks. I want to try this recipe for a dinner party, love soy sauce chicken. We are all Chinese so i am a little worried how this will turn out and don’t want to end up with one dish short. I am a little skeptical that the chicken will have enough flavor when cooked in this mixture just for 8 minutes. There is a separate recipe for the Master Stock mixture but the Master Stock mixture in this recipe seems to be made on the spot and not pre made. Is this correct? Yes, the master stock mixture is made on the spot and not pre-made in this recipe. Just make sure to do Step 3! No sugar as dark soy sauce has molasses and will be mixed with the master stock before applying to the chicken. This recipe looks great. I’m excited to make it. What kind of vegetable is that in the picture? Choy sum? Can I cook it like broccoli? Yes it is choy sum! They cook really fast like broccoli. It will take roughly a minute in boiling water (add salt + oil as seasoning) on stovetop! Good morning! Same cooking time for bone-in thighs? Thanks, and I do enjoy your recipes! Bone-in thighs will take 1 minute less! I’d like to make a whole soy sauce chicken (and keep it whole for presentation purposes). Any suggestions? We are still working on the best method to make a whole chicken in the Instant Pot without the chicken falling apart. This one was great. My daughter loves the chicken and the master stock. Thank you for another easy recipe. Any tips if I want to double the recipe? I would recommend cooking everything for 8 minutes + natural release as the chicken are done by then. If you are also doubling the rice and it is slightly undercooked, set aside the drumsticks and cook the rice for another few minutes! Hi there, I have a question. I plan to make this tonight but would like to have more rice. If I double the rice and water ratio, do I have to increase the time? Super excited to have this comfort food for dinner tonight! The rice may come out slightly undercooked if doubling the amount. I would recommend cooking everything for 8minutes + natural release and see how the rice is. If the rice is slightly undercooked, set aside the chicken and cook the rice for another few minutes! What cooking time should I use if it’s chicken drummettes? For chicken drumettes, it will take 5 minutes + 10 minutes natural release. Rice may come out slightly undercooked with the Pot in Pot method. Make sure to check and see if the rice is cooked perfectly before adding additional cooking time. I don’t have an instant pot. But I do have a regular pressure cooker. Do I need to make changes to recipe and cooking time due to this problem? For this recipe, the cooking time doesn’t need any change. Yes the drumsticks can be frozen. You don’t have to modify the cooking time as long as the frozen drumsticks are in individual pieces. What modifications would be necessary if the chicken pieces from a whole cut-up fryer are used instead of just legs and the amount of rice is doubled? No modification is needed for whole cut-up chicken, just make sure the pieces are at least partially submerged into the soy sauce mixture. Cooking time will stay the same for this one. The rice may need an extra minute or two with the pot in pot method. Fluff it and see if it is fully cooked first. The post and ingredients say “legs” but the photos only show drumsticks. Doesn’t “legs” mean the whole leg (drumstick and thigh combination)? Thanks! Yes, we usually call it chicken drumsticks in our recipes. 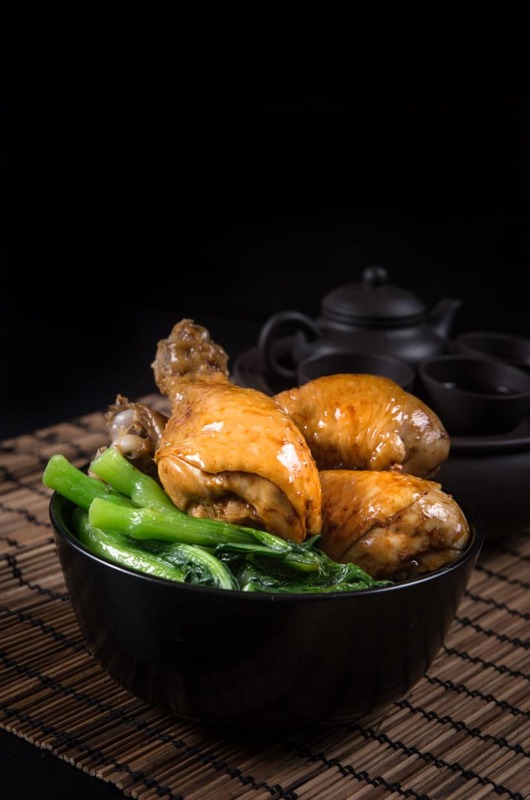 Since in Hong Kong, chicken legs usually refer to drumsticks instead of the whole chicken quarters so we have decided to stick with the chicken leg name for this recipe. Does the cooking time change if I am cooking the chicken only without the rice?